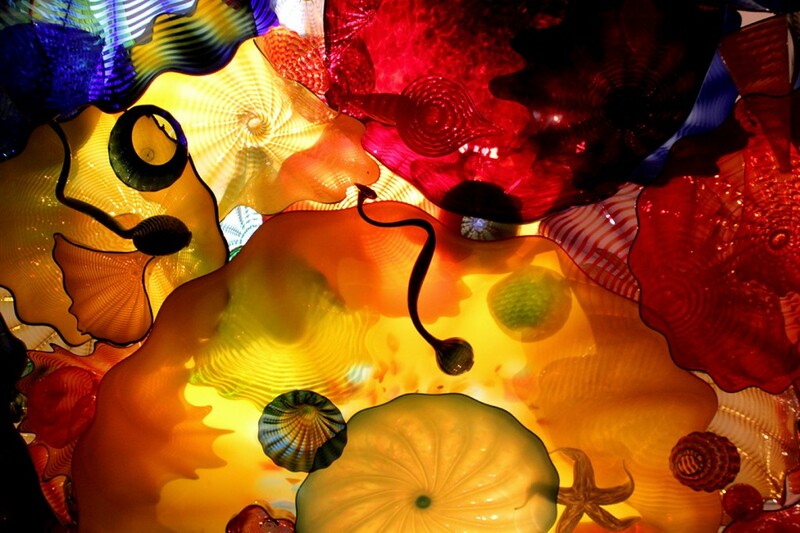 Dale Chihuly never disappoints and has brought a rejuvenating vibrance back to the Seattle Center. 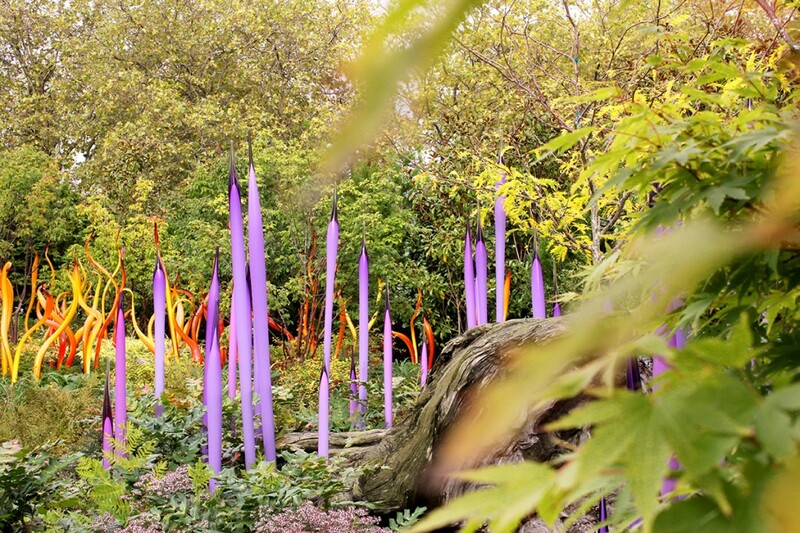 Located on 1.5 acres, the Chihuly Garden and Glass exhibit found a permanent home, well at least for a few decades. Dale’s a fellow Washingtonian so it’s fitting that he has a space where he will be celebrated for years to come. 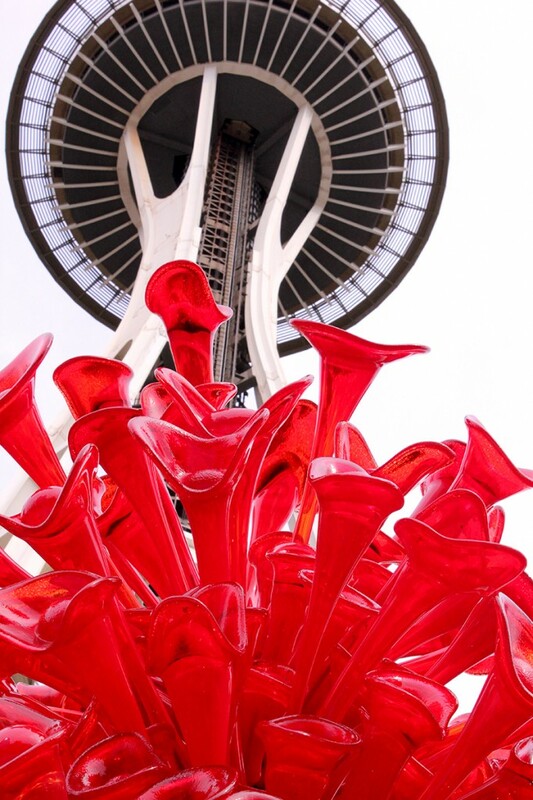 Color, movement, sculptures, chandeliers and sketches fill up over eight gallery rooms, a green house and large garden—all sitting within the shadow of the Space Needle. 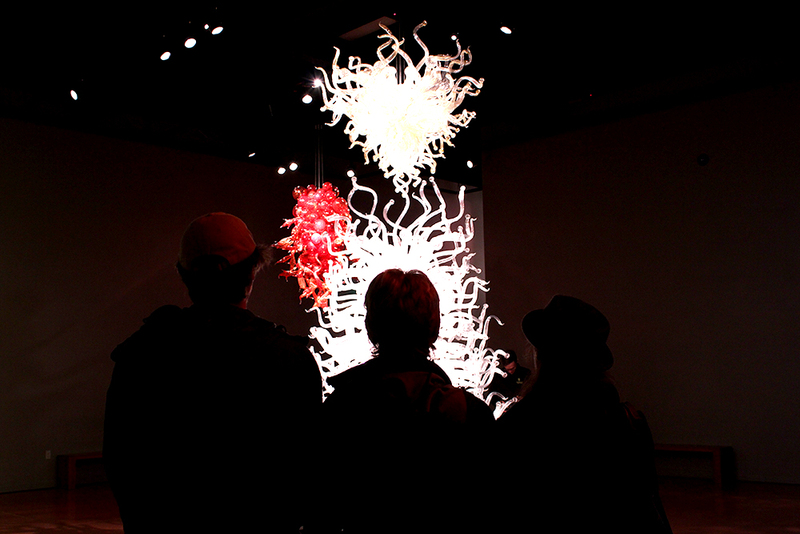 After passing the first neon piece of work, you step into the Northwest Room, which shows off Chihuly’s inspiration from the Native American culture. This room is filled with gorgeous pieces that reflect Navajo textile design. 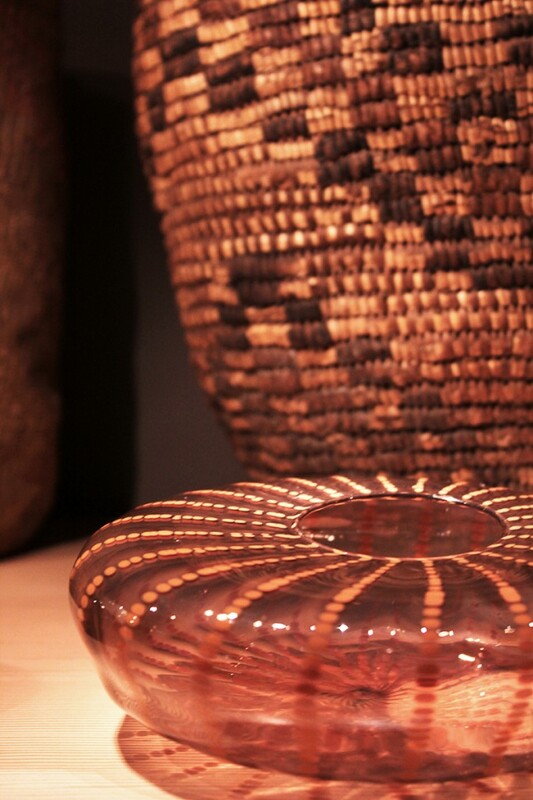 The Basket series allowed him to foster a sense of asymmetry. This room also holds his Cylinders and Soft Cylinders series. The Sealife Room is like walking into a dreamlike state. 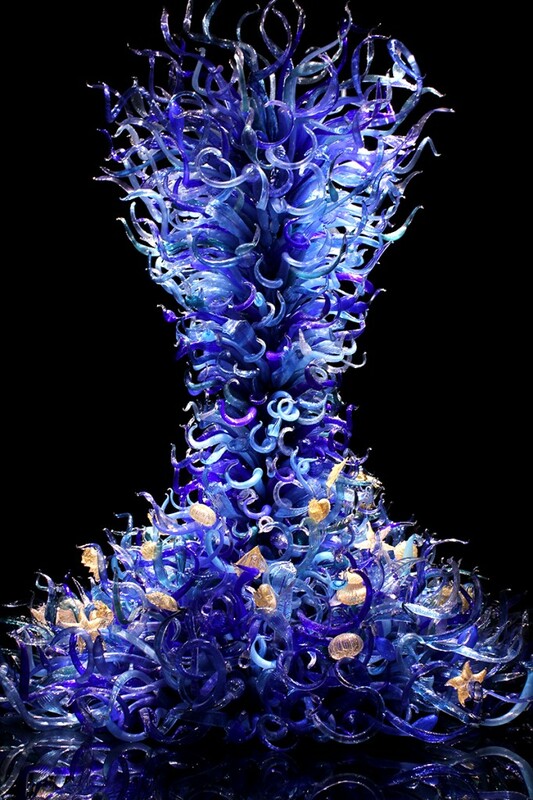 The 15-foot tall blue structure was too heavy to be a chandelier, so it looks like it’s being revived from the deep blue sea. 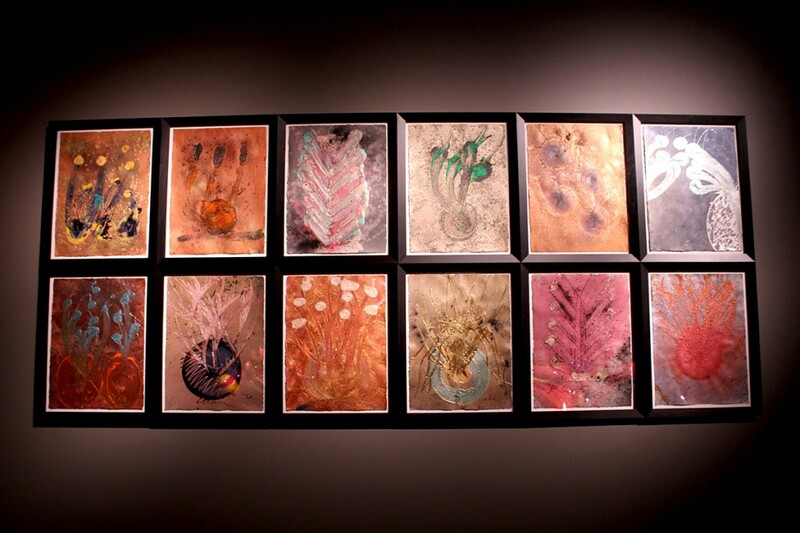 This gallery room displays Sealife Drawings and smaller Sealife Vessels. The Persian Ceiling was the perfect interlude to the next room. 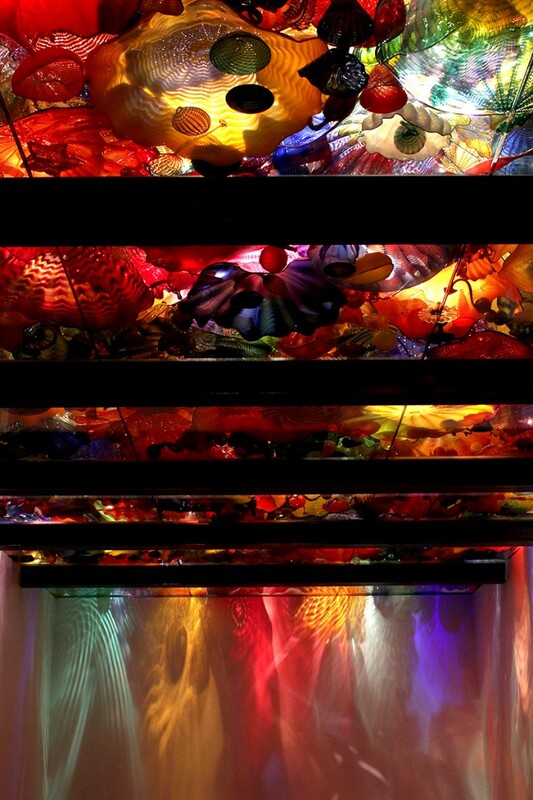 The art is overhead; glass delicacies lay on a glass ceiling emitting endless colors onto any wide-eyed art watcher. 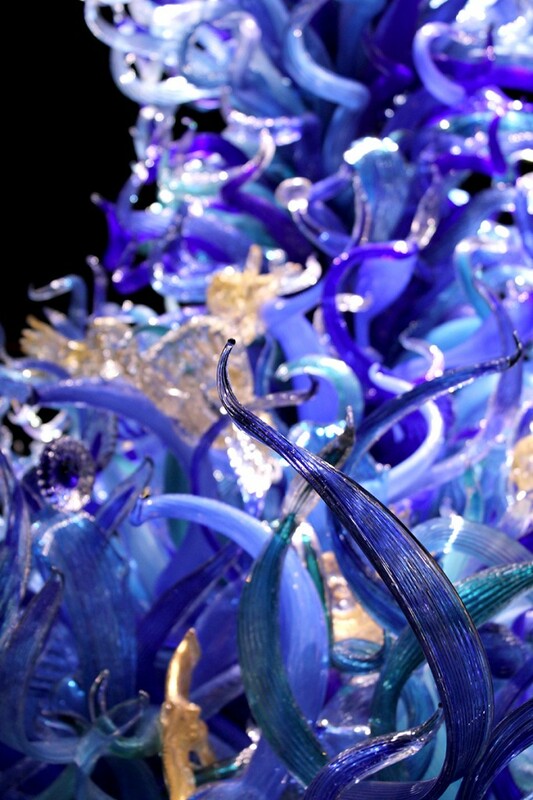 Mille Fiori is one massive glass garden. It reminded me of the original Charlie and the Chocolate Factory scene where all the plants and even grass where edible wonders. It’s a fairytale that’s hard to not walk into, unless you want to cause thousands upon thousands of dollars in damage. 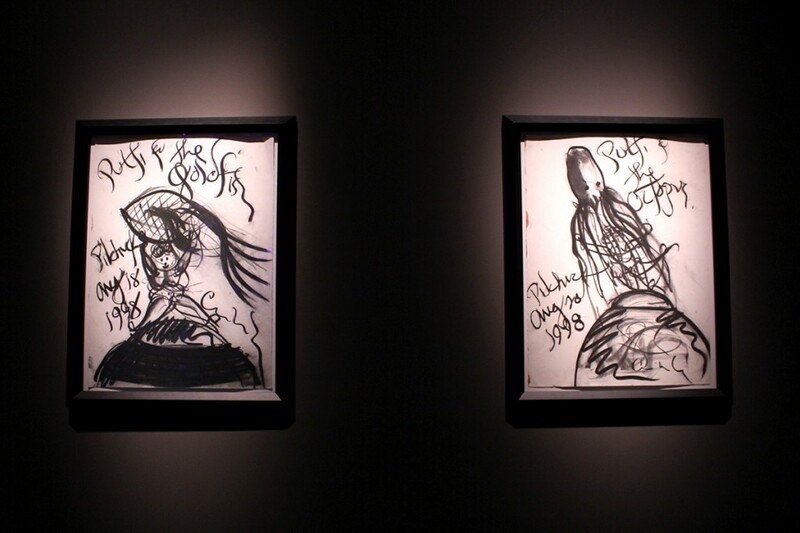 The Drawing Walls followed, this was the period in Chihuly’s life when he lost sight in his left eye, so resorted to expressing his visions on paper rather than via 3D sculptures. He paints with acrylics, dry metallic pigments, charcoal and graphite. He even burns the paper with a torch for that extra touch of intensity. 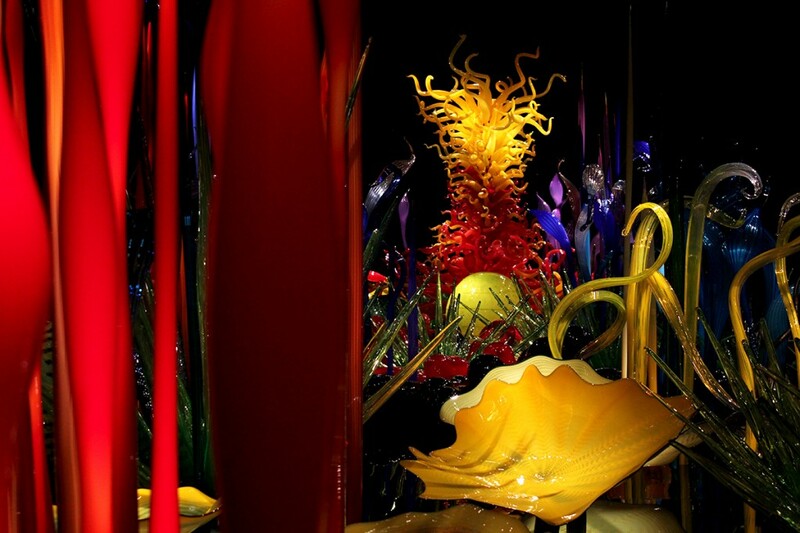 Chihuly Wonderland can be wrapped up in the Ikebana and Niijima Float Boats. 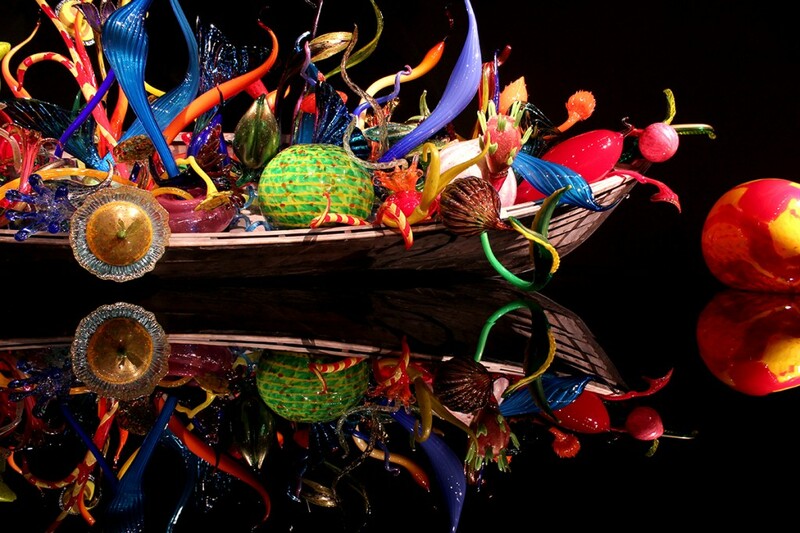 There are two Chihuly rowboats filled with glass art that is reflected from the shiny black surface, providing visions of what the art would look like if drifted over water. 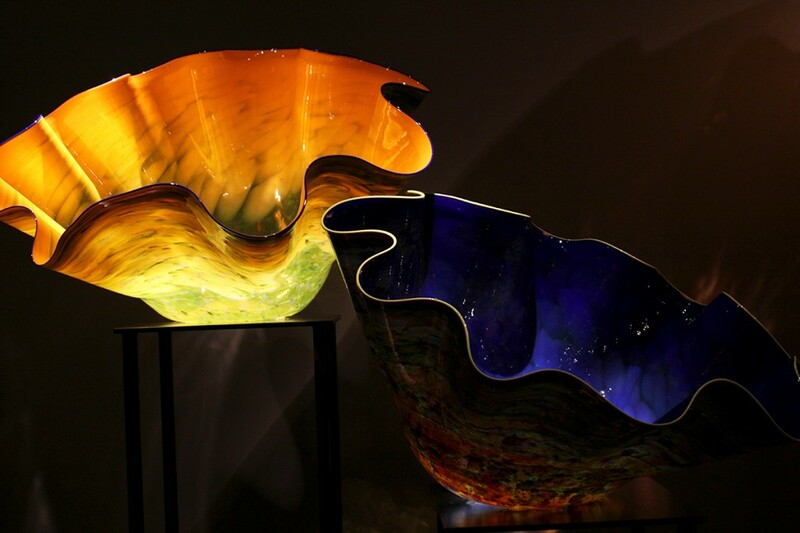 The Macchia Forest, meaning stain in Italian, is a large series of glass bowl objects where Chihuly added a white layer to each piece in order to separate the exterior and interior panes to create a more intese contrast. 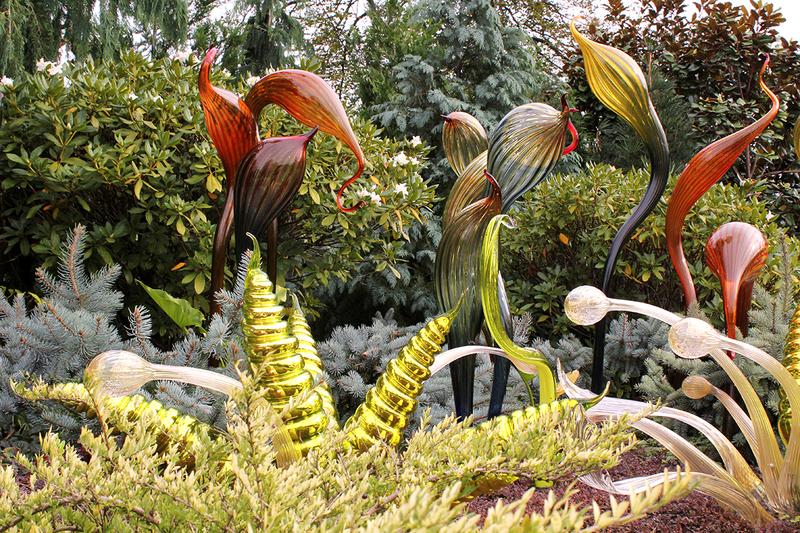 The Glass Garden was the perfect finish. The open space is filled with colors and shapes. 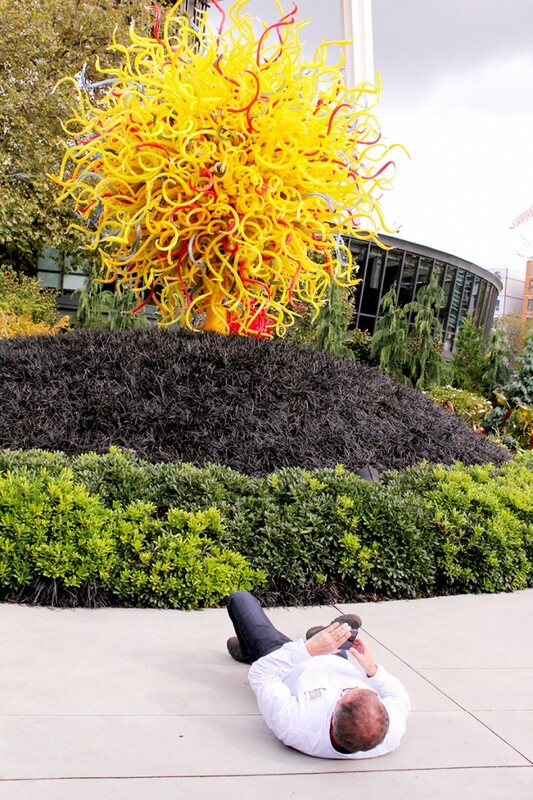 I even caught a guy on the ground taking a grand shot of the Space Needle, check it out below. 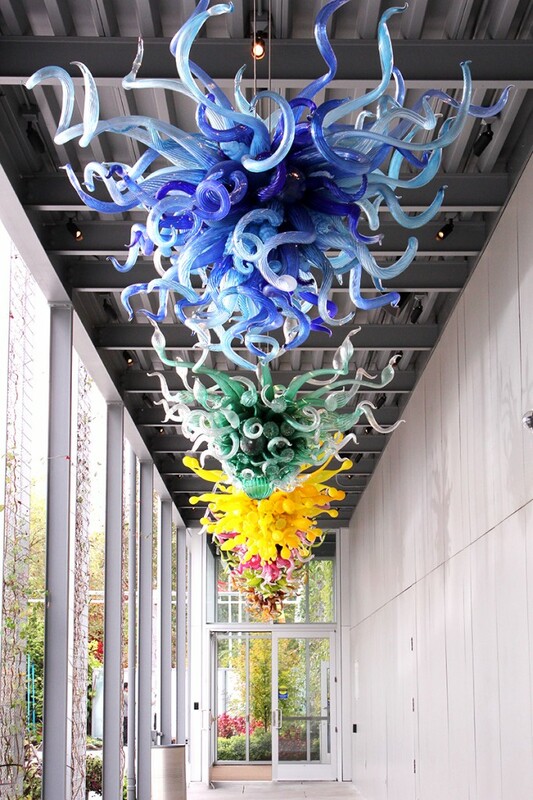 Visit the Chihuly Garden and Glass website for hours and ticket fees. 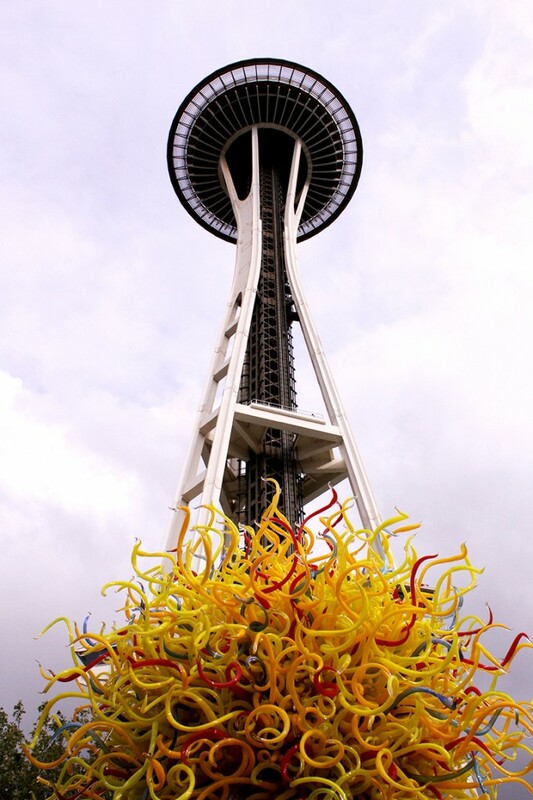 You can also get a package rate that gives you access to the 30 second elevator-ride up to the top of the Space Needle! 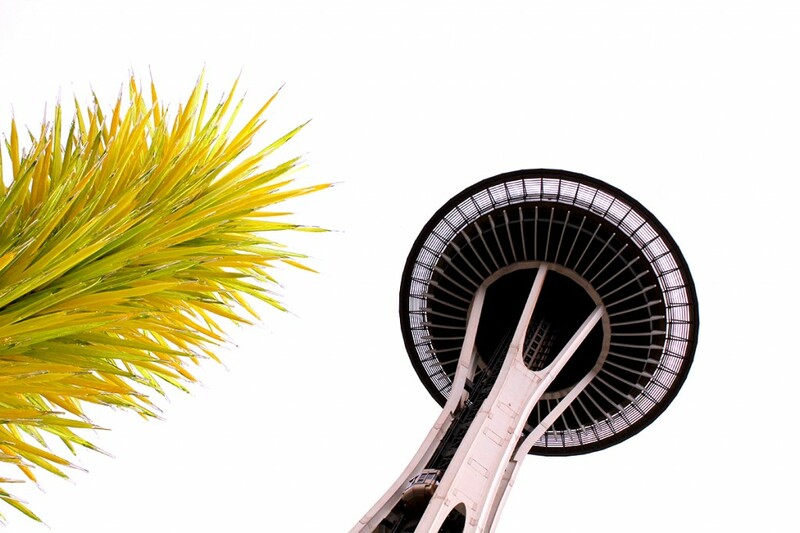 In case you can’t visit in person, you can still listen to Chihuly in Seattle here in a prerecorded tour that explains the concept and background story about each section in the exhibit. 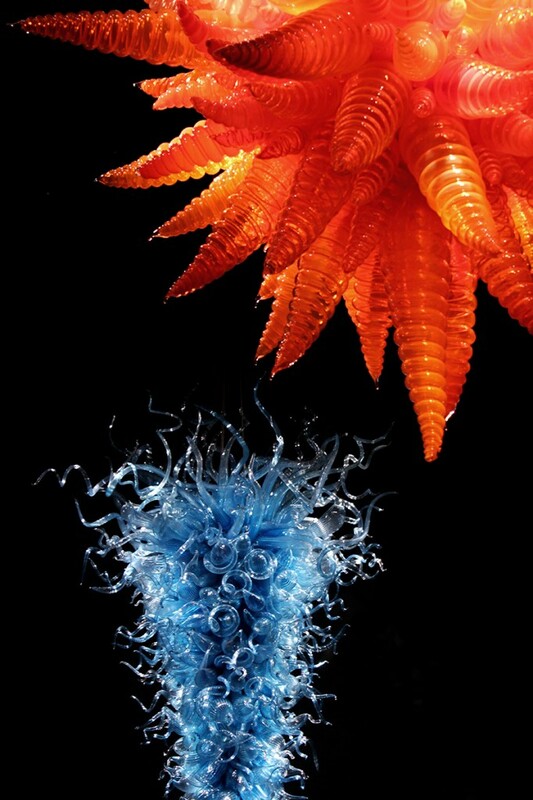 What’s your favorite Chihuly piece? 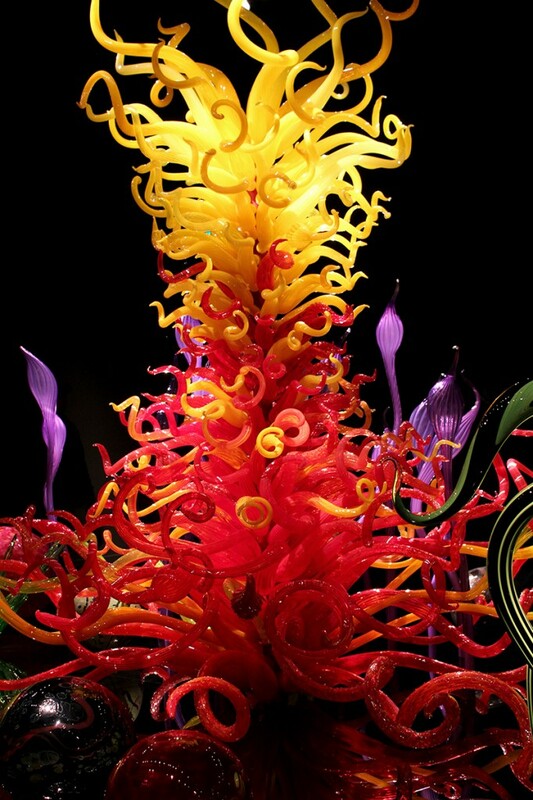 There is a similar yellow sculpture in the MFA in Boston and another like the spiraled blue one at the top at the Mohegan Sun Casino in CT. 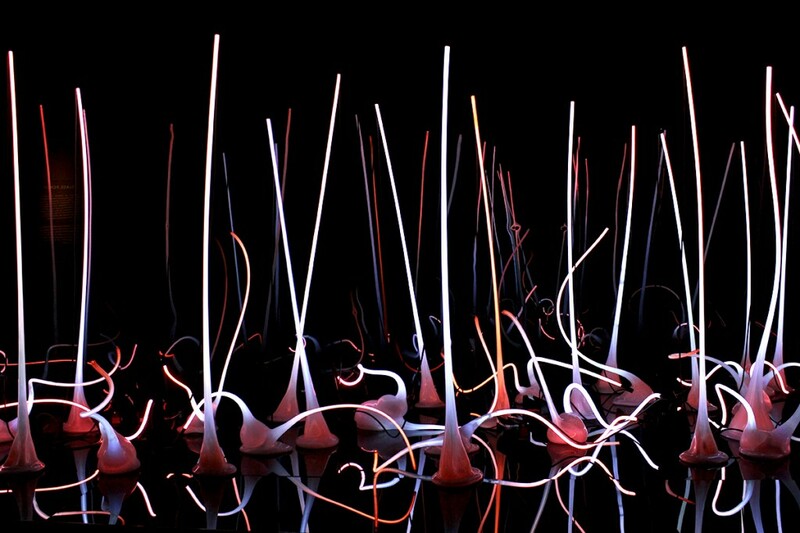 I lived in Seattle in the early 90s and worked at a place that sold Chihuly the containers he used to mix his paints. He used to send an empty cab to pick them up! Great story, I love seeing his work when I travel! 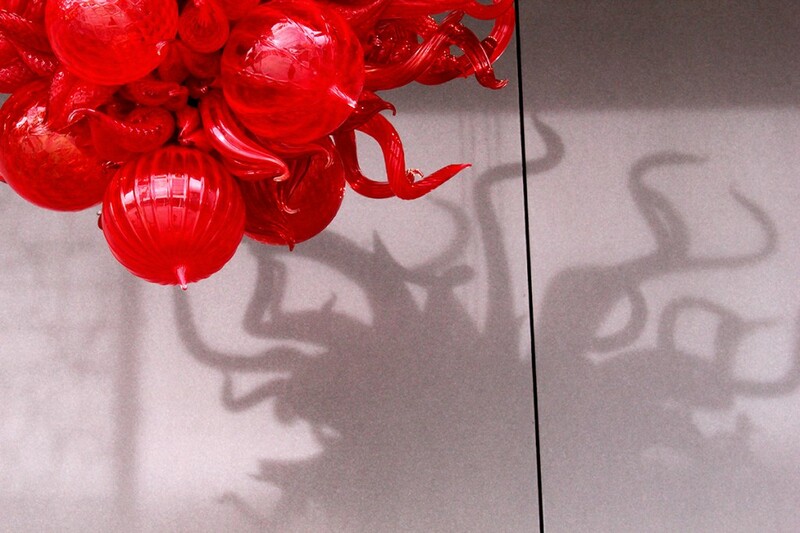 unimaginable creativity, these are some of the formidable interpretations offered by Tiana Kai. Love looking at these pics! The Persian Ceiling and its flood of descending light is the piece that remains in my psyche. Just beautiful! It was astonishing to see when I walked in that room, totally unexpected! 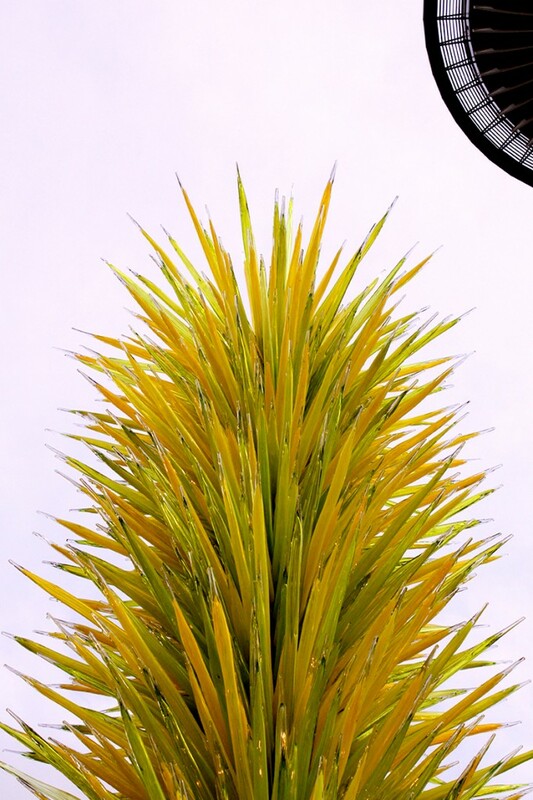 We were lucky enough to see his work in Palm Springs, so beautiful and photogenic. Love this post! I love how active he is with hie work. It’s so nice to share art with others. 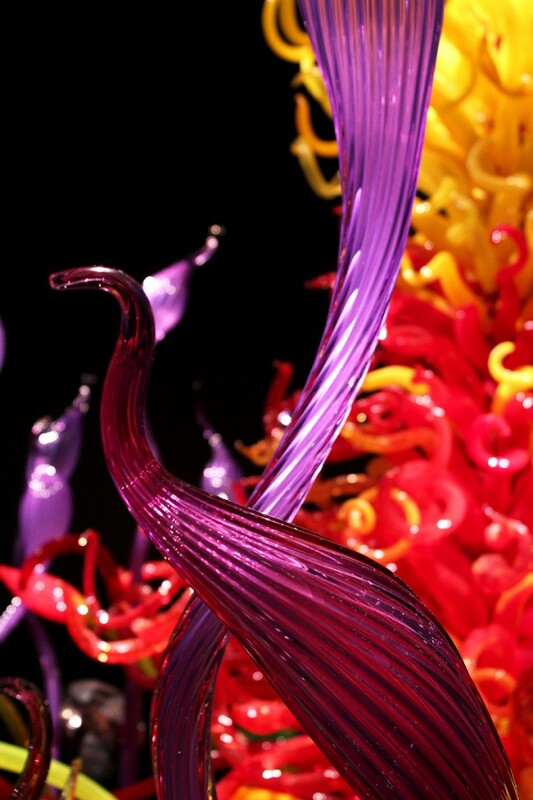 He has a few pieces displayed at Fairchild Tropical Garden in Miami and they’re incredible! Loved your post as it reminded me of my visit in spring, 2014. 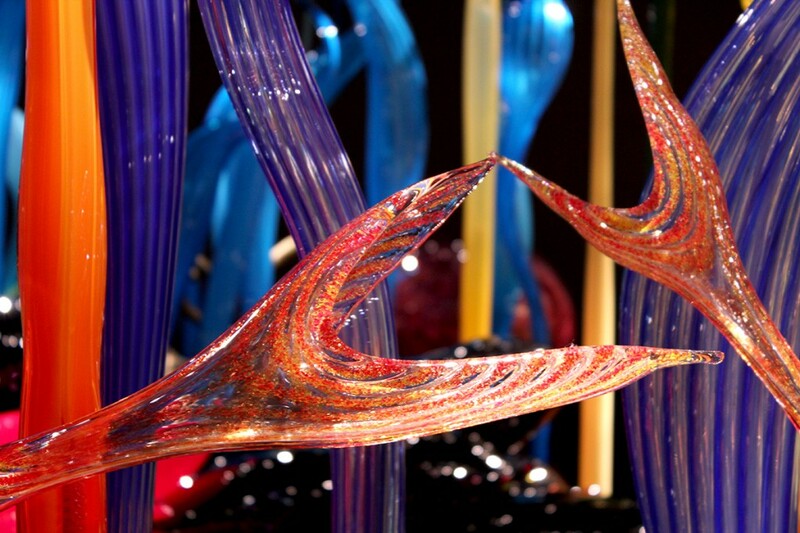 Then realized I’d seen one of his sculptures on Murano when I visited in 2011. We share a similar eye for photos. I used one of my shots for my business card and website. Thanks. I’ll be back as I love Florence and look forward to returning. Your blog will inspire. 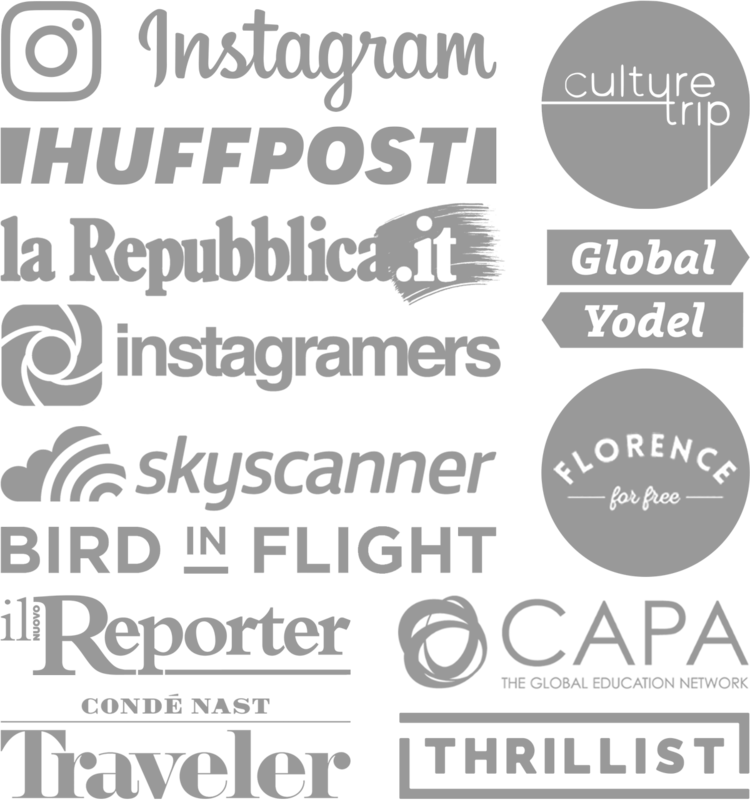 Hi Katharine, thanks for stopping by and have fun on your return to Florence!